Window coverings have a big impact on the comfort, aesthetics, and lighting of a room. From blinds and shades to curtain and drapes, you have plenty of options available. If you’ve decided on plantation shutters for your windows, you still have a few choices to make. Use this guide to help you decide what type of shutters are right for you. Natural wood shutters: The very first window shutters were made of wood, and this material continues to be popular today. Wood has a high strength-to-weight ratio, so it’s light and durable. You can also paint or stain natural wood to change its look. Choose from stained wood for organic charm, lacquered wood for extra protection and exotic wood for charismatic appeal. Composite shutters: Also called faux wood, composite shutters are best suited for small windows and moisture resistant. They are made from engineered wood encased in vinyl. The composite material is heavier in weight than wood shutters. Vinyl shutters: The low cost and humidity-resistance of vinyl make this material highly appealing. These shutters are usually hollow, but some styles have wood support for added stability. Poly-core shutters: The most high-tech window shutters available utilize breakthrough polymer construction and a metal core to ensure a long life without sagging. These shutters are elegant, operate smoothly and look amazing. Just be aware that the color options are limited. Commercial grade shutters: When you want your window coverings to last a lifetime, consider shutters made from commercial-grade materials. You’ll enjoy maximum durability for an extended lifespan, even under the most demanding conditions. Shutter panel styles: Choose from full shutters that open as one panel; café-style shutters that only cover the bottom half of the window; double-hung shutters that open independently on the top and bottom; or shutters with divider rails that allow you to operate the top and bottom louvers separately. 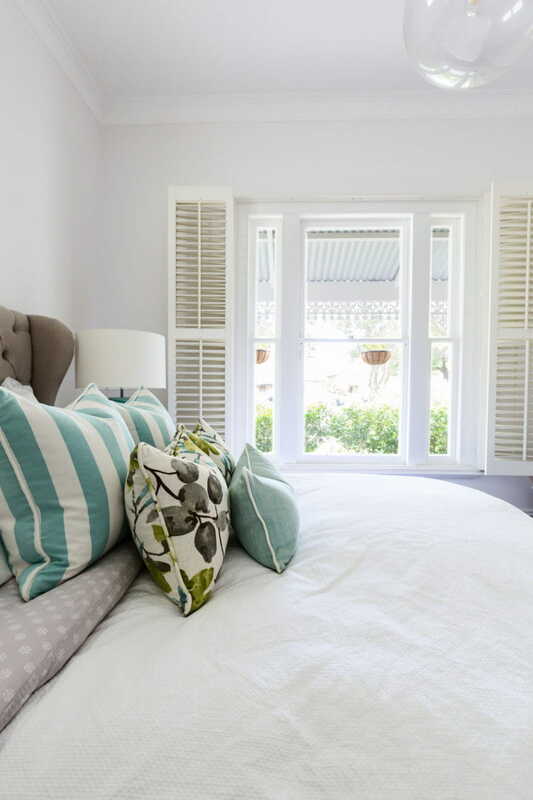 Shutter mounting styles: You can mount your shutters inside or outside the window opening. An inside mount – which includes hinge-only mounting or an “L” frame – is suitable if you already have decorative trim around your window. Shutter molding types: If your window doesn’t have decorative molding, you can add it when you install plantation shutters in the form of an outside window mount. This option has built-in molding to give your window a finished look. Styles range from simple to highly decorative. Louver sizes: Louvers are the part of the shutter that pivots open and closed depending on your lighting and privacy needs. Louvers range in size from 1¾ to 5½ inches wide. Little windows look better with smaller louvers. Likewise, big windows appear more proportional with larger louvers. Tilting options: Traditional plantation shutters feature a tilt bar on the front and center of each panel. This is the most common tilt option available. However, if you prefer a more streamlined look and want a clearer view out the window, you can select a hidden tilt, which is located on the back and off to the side of each panel. Both options work the same; it’s simply a matter of aesthetic preference. Once you select a shutter material and style, the final step is to choose a color. White is an ever-popular hue because it never fades, doesn’t draw attention to itself and matches just about any décor. Of course, colored plantation shutters are also an option. For a streamlined look, choose wood shutters stained to match your kitchen cabinets or window trim. To make a statement, have the manufacturer color-match your shutters to complement your aquamarine sofa or salmon-colored bedspread. In the end, the type of shutters you choose depends on your tastes, the design of your home and the size of your budget. Rest assured that when you work with Bay Home & Window, you’ll enjoy professional design advice to help you make the right decision. Then, no matter what material, style or color you choose, you can expect quality craftsmanship and a product that’s built to last. You’ll be pleased to hear that we offer the largest selection of plantation shutters in the Bay Area. We also offer additional benefits to ensure the best possible customer service, including free in-home consultation and professional installation. Best of all, our products are available at wholesale prices! To request an appointment, please contact Bay Home & Window today at 888-766-5919.